This series of posts about Yoeme (Yaqui) Pascola masks began on July 4, 2016. When I began attending the Yaqui Easter fiesta in Tucson, Arizona, beginning in 1989 and continuing over the next 25 years or so, I quickly discovered another Yoeme carver—Antonio Bacasewa. Although Antonio lived in Vicam, Sonora and he did not often travel to Tucson, his masks were widely available in Indian arts stores there, because they were being brought up from Sonora by some important Indian traders, Barney Burns and Mahina Drees. I will tell much more about that couple in a future post. Antonio Bacasewa’s masks are notable because, although they were made for sale to whomever might want them, they were carved creatively in traditional designs from the usual wood—raíz de Álamo (cottonwood root). Furthermore they were smoothly finished and of normal size. That is, they were perfectly appropriate for dancing, and dancers frequently did buy these masks for their own ceremonial use. Yet Antonio’s masks were also inexpensive and interesting enough to attract tourists and collectors. While some other carvers made different styles of masks for these two potential markets, as I will vividly demonstrate in future posts, Antonio produced a uniform product that was suitable for both. I view Antonio as an important and innovative folk artist. He died in 1991. 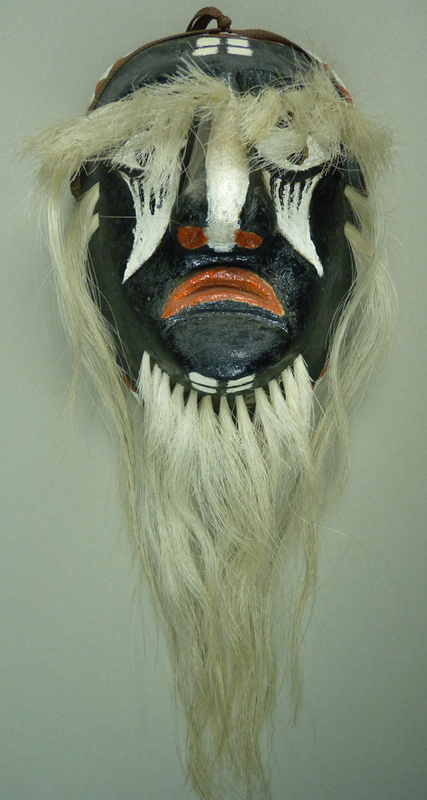 Here is one of those undanced masks that I purchased from an Indian arts store in Tucson. I liked them so much that I bought many of them, over the years. Note the graceful line of the cheek. I suppose that the animal painted on the side of the mask is a scorpion, or maybe this is just a lizard. From this angle the design of the mouth is interesting, even if anatomically doubtful. I cannot look at this mask without imagining a character with this face in the rain, catching raindrops with his extended lower lip. This is of course my own idiosyncratic idea, but it is grounded in the knowledge that the Yoemem (Yaquis) consider rain to be a sacred gift from the Sea Ania (the Flower World). Today I want to show you three more Yaqui Pascola masks that were carved by Alejandro Reyes Alegria. All three are from the collection of David West, the owner of Gallery West in Tucson Arizona. David had kindly given me permission to photograph and publish these masks. The first is another human faced Pascola mask by Alejandro. This one was collected directly from the carver by Richard Felger in 1984. I particularly like this mask’s frowning mouth. In June, 1988 I bought several Yoeme (Yaqui) Pascola masks from the Folklórico gallery in Santa Fe, owned by Robin and Barbara Cleaver. I will introduce today’s post with one from that group that has a goat’s face. 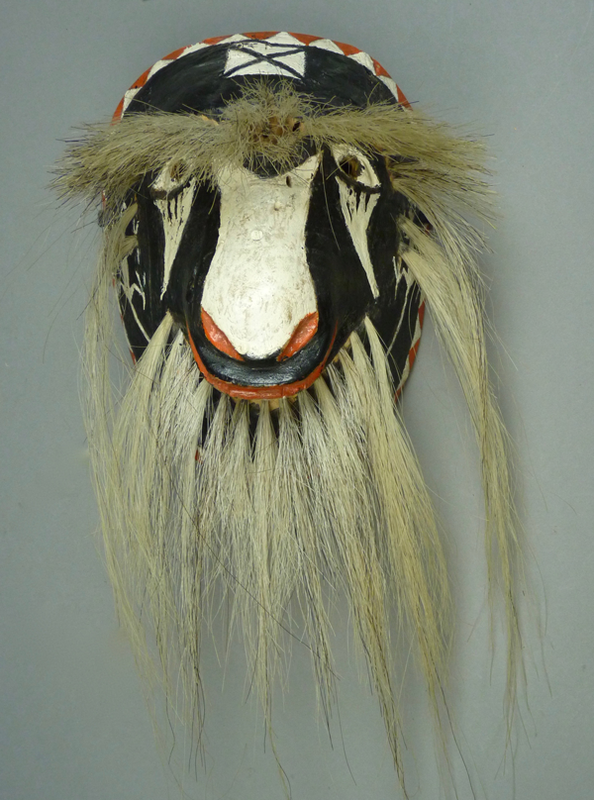 Like the mask that introduced last week’s post, this Goat Pascola mask came without any identified carver. However it had such distinctive design details that it proved relatively easy to identify, as I will now explain. To begin with, I met a botanist in Tucson, Arizona, Richard Felger, who had known the carver, and my friend Tom Kolaz was also familiar with his work. Both agreed that my Goat faced mask was the work of a man some called Alejandro Reyes and others called Rexes Alegria (in an instance where the x is silent), as his full name was Alejandro Reyes Alegria. He was a carver and dancer from Potam, Sonora and he often traveled to Tucson to dance at Yaqui fiestas there. Richard Felger recalled that Reyes died mysteriously; convinced that his death was imminent, Reyes seemed resigned to this probability, sought no medical care, and soon he was dead. Here is this mask. In this frontal photo one can see many typical features of this carver’s work. To begin with, here is his typical forehead cross, which one could describe as four triangles with parallel edges or as a square that has been subdivided by diagonal lines. Also typical are the triangles under the eyes, marked with vertical black painted lines. The painted lizards on the cheeks are also characteristic. He usually used this rim design, but that is a generic design that does not distinguish one carver from another. I published the opening post of this blog on July 7, 2014. Since then it has appeared weekly for two years, for a total of 104 postings (plus one more by a guest). Over that period of time I have had 12,000 individual visitors. Today’s post opens year three. For curious readers who are discovering my site at this late date, such a backlog of articles might seem overwhelming. I myself can generally recall what I have written about, but I am constantly surprised that it was so long ago! For our mutual benefit I have replaced the Index with a “Week by Week” summary that you may access with the Index pull down at the top of this page. You can readily shift to any desired month in the blog by clicking on that month in the Archives on the right side of the home page or on the Index page; there you can scroll through the introductory remarks for the four or five posts that appeared during that month, opening one or another as you please and then backing out to look at the rest. Thank you for visiting and if all this is new to you, welcome to the community of Mexican Mask enthusiasts. I became interested in Yaqui and Mayo Pascola masks during my first year of collecting Mexican masks (1987-88). For many years I have been intensely studying masks like those I have collected, curious to know about the carvers, the dances, and the masked characters. 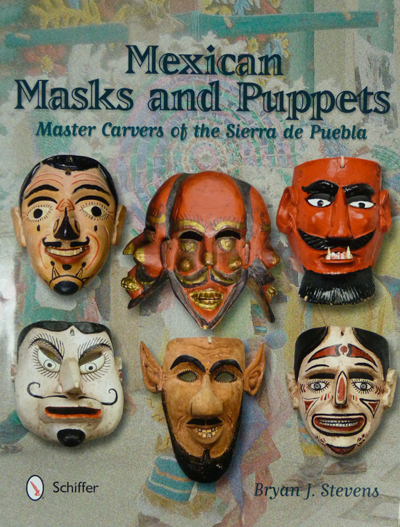 In the case of the Pascola masks, I have repeatedly visited Yaqui fiestas in Tucson Arizona, I have amassed a library of out of print books on the subject, visited museums, and documented the masks in various private collections. 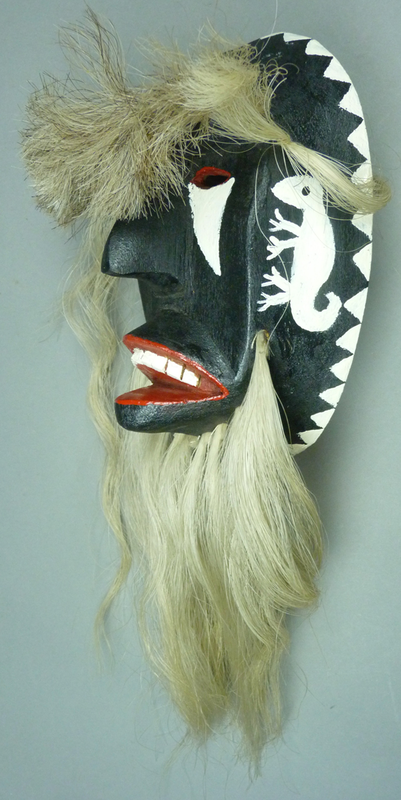 I am working on one or more books about these masks. 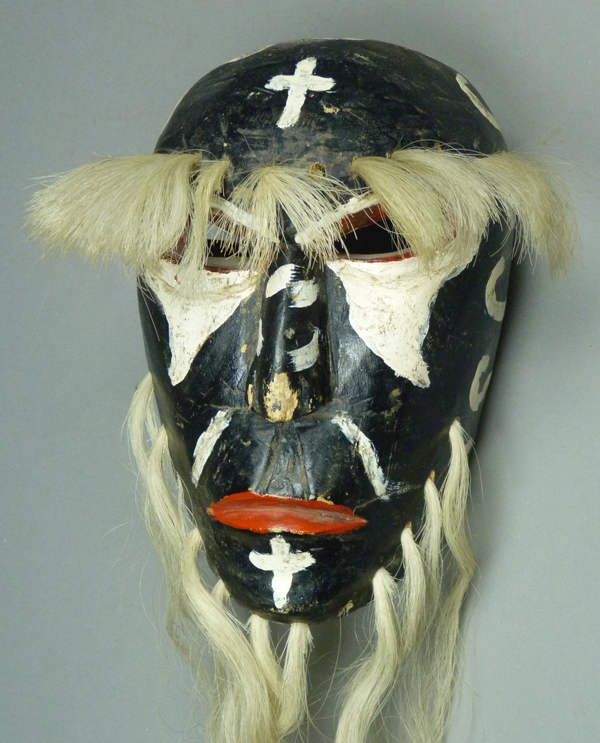 Today I begin with Yaqui Pascola masks, initiating a series of posts about what I have learned. The Yaqui Indians, who have lived in the Mexican state of Sonora for thousands of years, call themselves the Yoeme (the People). The plural form is Yoemem. Out of respect, I will frequently refer to them with these names in their language. The Mayo Indians, who speak a nearly identical language, call themselves the Yoreme. In June of 1988 I purchased several Yoeme Pascola masks from Folklórico, a folk art gallery in Santa Fe, New Mexico that was owned by Robin and Barbara Cleaver. Here is one of those masks. I bought this as an anonymous mask, choosing it because I liked its design and patina. I particularly liked the swirling white lines that made up the rim design (the painted elements circling the rim of the mask).